Request a free document for understanding the benefits AIUTO can introduce in your project. AIUTO has been designed to process natively C code but can be extended to any language, reading the code from the most used SW versioning tools like SVN, CVS or shared File Systems. The tool has been designed to generate and maintain test scripts and procedures compatible with IBM RTRT and Cantata++. Other testing environment can be added by configuring the appropriate plug-in. 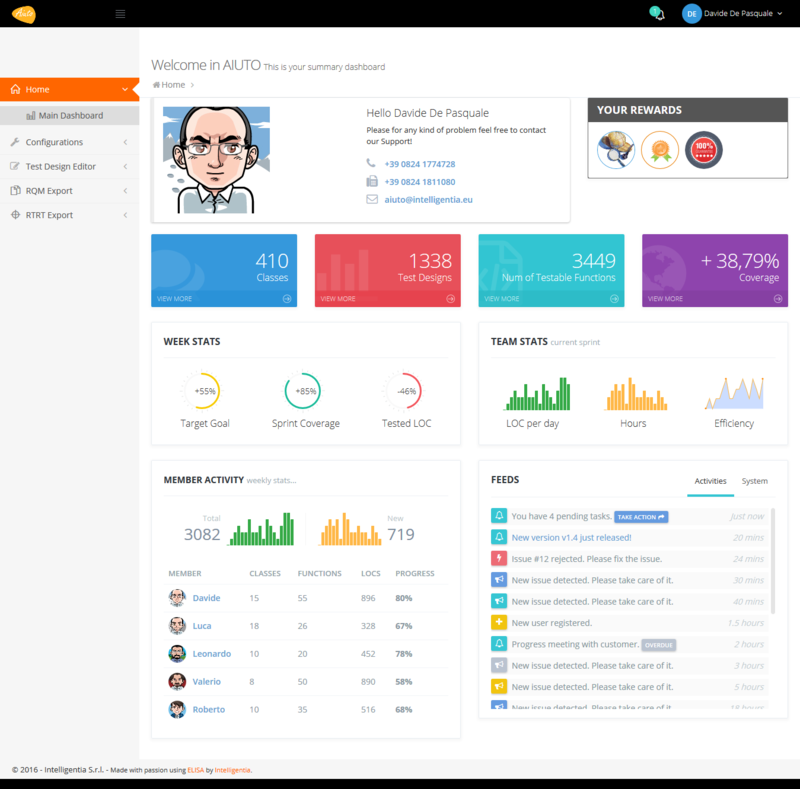 AIUTO allows you to design and implement tests for your test plan and to monitor KPIs and progress in a single configurable dashboard for the Management or Customer reporting. Testers can cooperate in a shared environment with access privileges to check and manage work load balance for each user. Testers can cooperate on the same test using a rich editor! AIUTO has been designed to allow one-click documentation generation. The tool generates fully customizable documents compliant with your standard of quality and naming convention and in the most common file format (DOCX, PDF, XLS). AIUTO provides a gamification engine that will produce and assign badges and rewards to your team augmenting the user involvement and dedication. 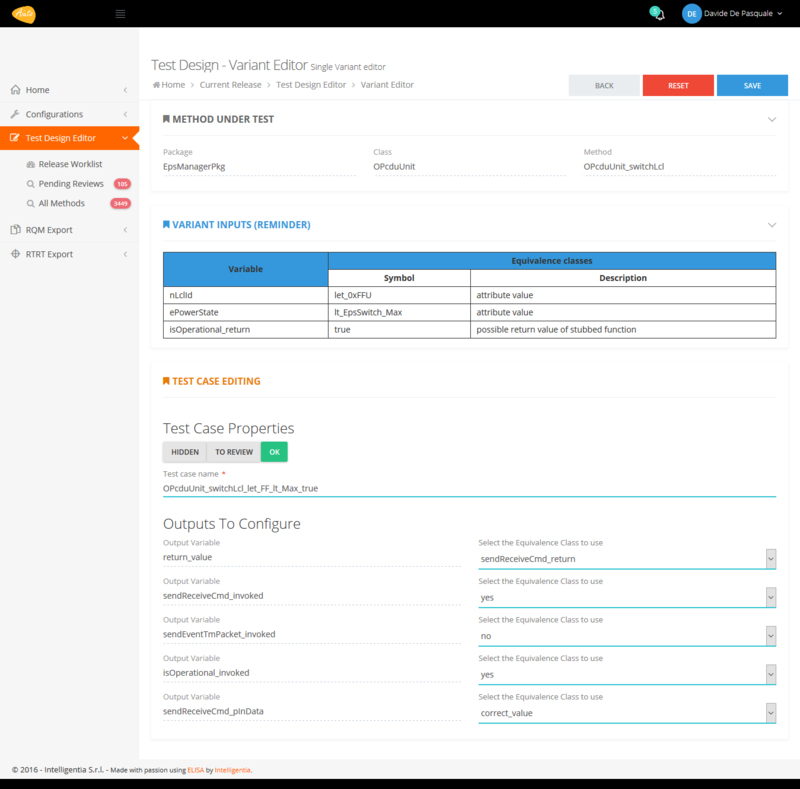 A test server can be integrated to schedule automatic execution of a tagged release or nightly build SW versions, enabling a continuous integration process. AIUTO has been designed for an hybrid cloud environment where data and application can stay in two different nodes in Internet linked by secure VPNs or dedicated network infrastructure. Because your security matter to us! AIUTO offers a modern interface with Material Design effects and rich set of HTML5 components for a great user experience. If you are interested in adopting AIUTO in your project, we can offer to you three basic plans. What we suggest is an Hybrid approach: you will maintain your data at your place by allowing AIUTO to access the basic resources needed such as a shared folder or a SVN repository used to process the software released for a new version. 1 An hybrid configuration will require a VPN connection between Intelligentia's premises and your datacenter. The AIUTO instance will be executed and maintained on our servers, the rest of the applications and all integrable plugins will be at your premise. This is the best solution for not-shareable source code. 2 The most flexible licensing we can offer. A virtual token is assigned to each user that uses a functionality that is altering the status of the server (write mode). At each token is attributed a fixed cost and a validity for the current solar day. No limits on users, no limits on read-only accesses (eg. PA, QA, or your Customer). You will be able to add new tokens by paying on-line (Paypal, Credit Cards) for the new required effort. 3 A license for each user registered in the tool. Prepayed and with a license key delivered by email. 5 Your Software Validation Facility (SVF) has to be provided in a Virtual environment (VMWare, VirtualBox or Hyper-V) by the customer at set-up time with a at least one valid RTRT/Cantata++ license. AIUTO will optimize an execution queue shared between all the instances and users. It means that test execution will be asynchronous with the user request. A report will be generated and communicated to the users after the complete execution. We can demonstrate AIUTO potentialities for testing your software... whatever it does, wherever you are! AIUTO development stated first as an internal tool to answer a very challenging project from our major Customer. We are currently using AIUTO to design and implement tests related to the verification and validation of the on board SW of the biggest Satellite project in Europe. Thanks to AIUTO we are able to offer to our new Customers a very clear and trasparent cost per line of code (LOC) for Unit Testing of on-board software (platform and AOCS algorithms). The LOC cost, of course, may vary in respect to the type of coverage, the percentage of coverage to achieve, the type of documentation to provide and any other customer request. Different approaches can be found for Integration test and Test Specificiation Validation with the possibility to involve our team of expert directly at your premise! 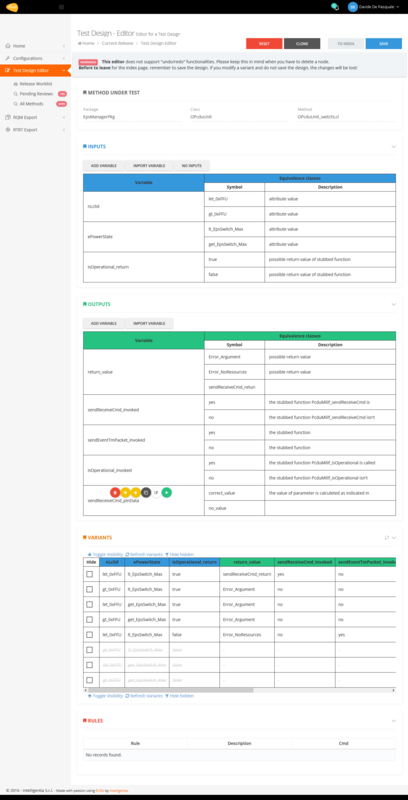 The Customer will get full control of the tests progress by looking at dedicated dashboard where for each class and each function an indication of the most relevant metrics, the SPR found and the current status of the work (on-going, complete, to review) is shown. Using AIUTO we have been able to test more than 20k LOC in less than 6 months with a team of 3 people. The tool has been used to detect the changes in the source code using the changelog generated by the versioning tool. AIUTO, reading the change log, was able to detect directly Test Designs and scripts to be rewieved. A dedicated workflow was adopted to process all the phases of a new software release from the tag creation on a SVN repository to the changelog approval by the V&V Team leader. AIUTO helped us in tracking the progress of our challenging platform refactoring by adopting an Agile organizational model. At each release, AIUTO was able to track the changes, suggest the functionalities to monitor and propose a test campaign to perform for regression testing. Each tester was measured in the effort spent and on which kind of code (eg. algorithms, utlities, key classes). The KPI to the management were delivered in one-click using a dedicated reporting plugin able to pupulate a template Excel file. We have outsourced to Intelligentia the tests of our software release and we have observed a progress of more than 1000 LOC per week! A great result because we have respected our schedule. AIUTO was used by us just to get access and look at the progress metrics of the Intelligentia's team. We have provided them our simulator through a SSH connection and AIUTO was successfully integrated so that we were able to receive feedback on test executions in real-time with all the success or issues emerging. For any inquiry or further information feel free to write us and one of our representative will process your request.